1926 Replica Teddy Clown by Steiff. This beautiful hand made piece, in delicate blond tipped mohair, is fully jointed and wears the white ear tag, signifying this item as a Steiff limited edition, together with the famous underscored patinated steel Button in Ear. Limited edition of only 926 pieces worldwide. Product details: glass eyes,wood shaving filling, non growler, size 25cm. Comes boxed, together with a numbered certificate of authenticity. Ashby Bears are proud to present, the new replica 1926 teddy clown. Between 1926 and 1928, around 30,000 Teddy Clowns left the Steiff workshops in Germany – all of them with black pompons and ruffs of blue, red, orange or purple. 90 years later a Teddy clown with black pompons and a black ruff pops up in Southern Germany! 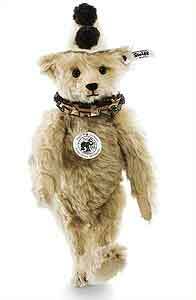 So Steiff are rewriting a bit of history and are showcasing the Teddy clown replica 1926. The bear is made out of delicately sculpted, decorative mohair features and is filled with soft wood shavings. The back of his glass eyes are painted dark brown. To match his felt hat with handmade pompoms he is wearing a pleated ruff. In his ear an "underscored-button” made of patinated steel. And he beguiles you with his clownish behaviour.